Drinking vegetable and fruit juices is something I have gone through phases with over the years. I should point out here that I’m certainly not talking about yucky, pasteurized “freshly squeezed” bottled juices, but rather freshly pressed vegetable/fruit juices, usually made with a home juicer. Despite the apparent healthfulness of the latter, I always encountered two schools of thought on juicing: the most dominant was on its numerous benefits, but I was also disillusioned after reading reports about the high levels of (natural) sugar content, which could cause spikes in insulin levels, and made me question how “primal” juice really was. Thus, I sipped in and out of daily juices until more recently… and I’m proud to report I’m now a firm advocate of the daily, freshly pressed vegetable juice! Why not just eat the vegetable or fruit in its whole form? Because most people don’t eat enough vegetables and fruit, and because our produce just isn’t as nutrient dense after being grown in depleted soil. 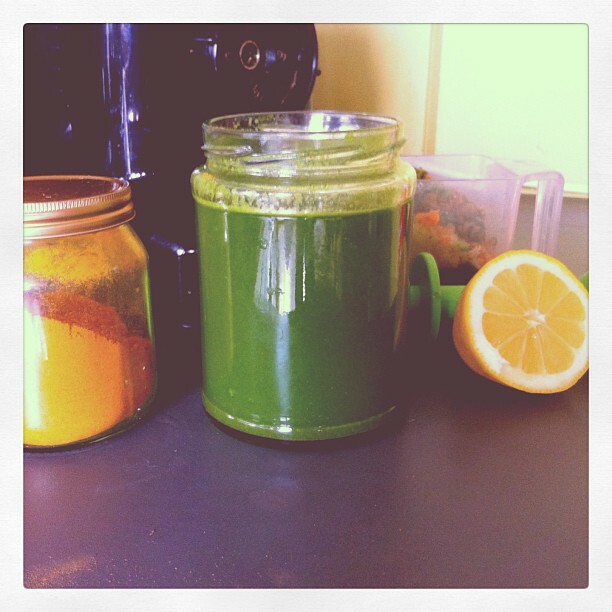 Juicing means you get massive amounts of concentrated nutrients without having to consume huge amounts of fruit and veg. You would never eat a pound of carrots but you could easily drink the equivalent in a glass of carrot juice. Don’t we need the fibre? Yes, but you can get fibre from everything else you are eating. Consider your juice like a supplement – a concentrated amount of nutrients in a glass. And if you do suffer from intestinal and digestive issues taking out the fibre can help heal the gut and allow you to better absorb nutrients. Isn’t fresh extracted juice high in sugar and won’t it spike insulin levels? Yes, if you juice a lot of fruit. No, if you mainly juice vegetables. The low amount of sugars present in vege juice are perfectly balanced with enzymes, minerals and other nutrients which the body instantly recognises and turns into energy. They act totally differently to those sugars found in nasty pasteurized and processed bottled ‘fresh juices’. 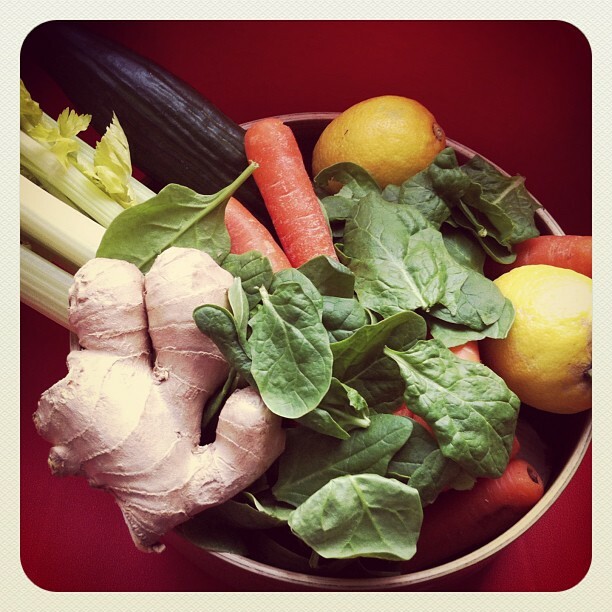 What about the oxalates in green vegetables that can cause digestive upsets? These vegetables are great to juice but in small quantities – you don’t need more than a few leaves of spinach/kale/collard greens/mustard greens/dandelion greens per glass of juice to get the benefits without the discomfort. What about adding fats like raw milk / eggs / avocado / chia seeds / ground flax seeds / coconut oil to make the juice more filling like a smoothie? Absolutely a great idea (especially if you are a protein type), as natural fats won’t interfere negatively with the nutrients available in the juice but will provide more sustenance if that’s what you’re after. The pioneers of juice therapy in the late 1800s were Dr. Norman Walker and Dr. Max Gerson – they brought juicing to the medical world by using it as a method to help cure all manner of ailments. Despite numerous cases of curing people from terminal illness, skin tuberculosis, cancer, migraines and headaches, and Dr. Gerson being awarded a Nobel Prize, juicing was still regarded as “radical”. Dr Walker died at age 99, while Dr. Gerson died under suspicious circumstances – with many suggesting the results of his juicing research were too much of a threat to major drug companies. Jay Kordich, a disciple of theirs, is the most current and loudest voice in the juice world today. Having cured himself of cancer as a young man through juice therapy he continues to spread word to the masses. Are rich in magnesium (cellular functions, muscle relaxant), selenium (immune support), zinc (hair, skin, eyesight health) , amino acids (memory, metabolism, cravings, brain energy) and many more nutrients. Come in endless variations and flavours! Ditch that conventional bottled juice! Smoothies: blend with avocado, eggs, pressed flaxseeds, chia seeds etc.